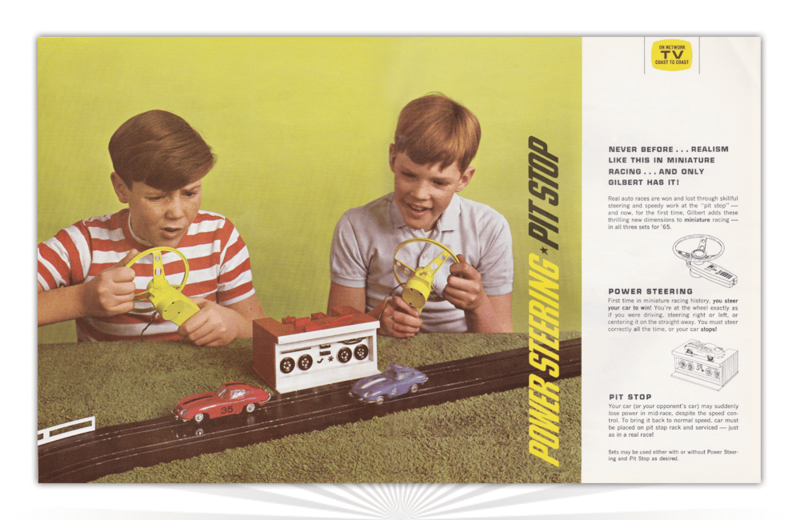 A.C. Gilbert’s Auto-Rama miniature car racing line was pitched as an auto racing game with that required “real racing skills.” This 1961 dealer advertisement features two add-on products. The Power Steering add-on put opponents at the wheel “exactly as if they were driving.” Using the steering wheel, each competitor had to steer their care right, left or to center on the straight-away. Incorrect technique caused the car to slow down or stop. The Pit Stop add-on added another twist. Cars racing on the track would periodically lose power and speed mid-race. To bring the car back to normal speed, kids had to place it on the pit stop rack to be serviced – just as in a real race. The Camp Granada game from Milton Bradley is based on Hello Muddah, Hello Fadduh, a novelty song of the 1960s.